Due to reports of almost having the quest for a Cool Runnings 2 dashed due to lack of funding, diGJamaica takes a look at the dedicated fund for sports in Jamaica – the Culture, Health, Arts, Sports and Early Childhood Education Fund, or more popularly known as the CHASE Fund. The CHASE Fund was established by way of the provisions outlined in the Betting, Gaming and Lotteries Act, to receive, distribute, administer and manage the monetary contributions from the gaming industry which it uses to invest in the following five defined areas of national life: Culture, Health, Arts, Sports and Early Childhood Education. All funds are from taxes and fees imposed by the government on lotteries and gaming. The CHASE Fund falls under the auspices of the Ministry of Finance and Planning. CHASE was incorporated on November 25, 2002 and began its operations in January 2003. 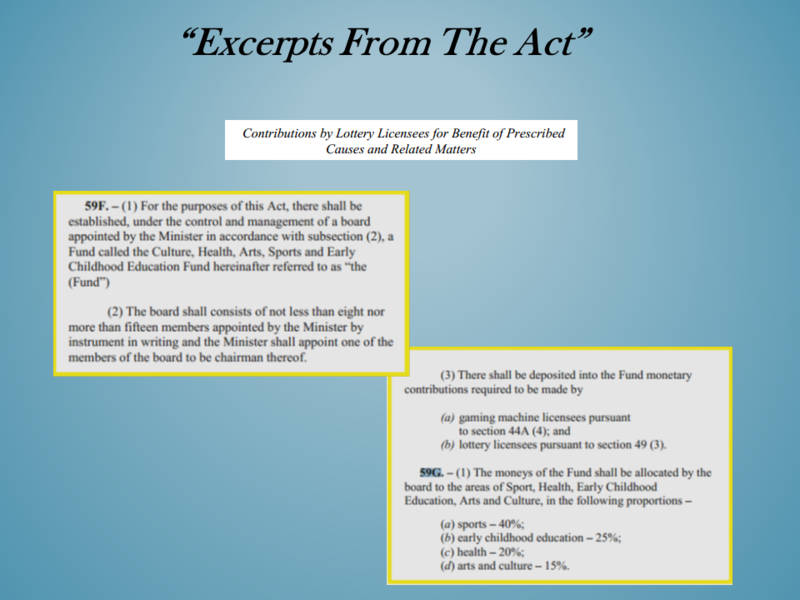 According to the 2011/2012 Annual Report “to date, the CHASE Fund has approved just over J$7.9 Billion for projects in Sports, Health, Education, Arts and Culture which represents 93% of the total funds received over the same period.” This is the latest publicly available information as at this time the 2013 Annual Report with 2012/2013 financial year data is to be tabled in Parliament. For the 2011/12 financial year, contributions to the CHASE Fund amounted to J$1.24 Billion (approximately US$124 Million), which represented a 12% increase over the previous year. In 2011/2012, hundreds of projects in all areas were funded by CHASE and diGJamaica encourages readers to have a look at the 2012 Annual Report to see the beneficiaries itemized. As CHASE is funded by ongoing lottery and gaming taxes and fees, this fund receives a steady and sizeable inflow of cash annually. According to the law, the CHASE Fund is mandated to allocate 40% of annual government tax and fee revenue intake from lotteries and gaming to sports. This is the single largest allocation given that 25% is allocated to Early Childhood Education, 20% is allocated to Health and 15% is allocated to Arts and Culture. The CHASE Fund invests in sports indirectly through the Sports Development Foundation (SDF). According to the CHASE Fund’s 2012 annual report, the SDF received $496 million for the year of which 95% was disbursed ($471 million). How is the money used by the SDF? 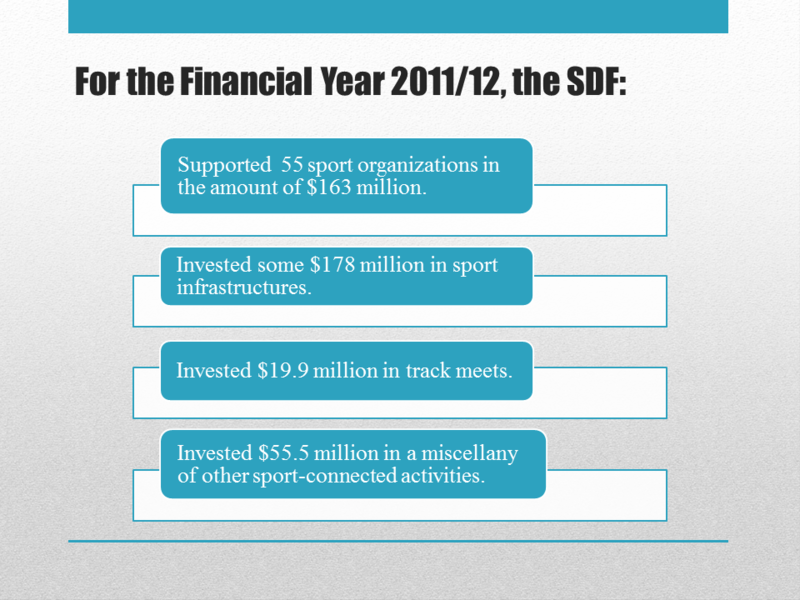 38% of the SDF funds for 2011/12 was spent on sports infrastructure projects and 35% went towards contributions to National Associations and Agencies. Of note in that year, a grant for $26 million or 13% was given to the Jamaica Football Federation (JFF). On the other hand, in the same year $26 million was shared among 35 sporting associations, inclusive of the Jamaica Olympic Association (JOA). The chart below is a user friendly summary of the use of SDF funds. By design, the CHASE Fund is supposed to have cash and is mandated by law to financially support sports. What those funds are currently committed to we do not know. The best we can do is show you what it was committed to in the last financial year available (2011/2012). On January 20, 2014, the JOA issued a release confirming that the 2 man Bobsleigh Team had officially qualified and was indeed headed to Sochi and that “all travel costs of the team from Salt Lake City (USA), Calgary (Canada) and Kingston, Jamaica to Sochi are covered by the JOA and Sochi 2014 Organising Committee.” On January 21, after immense international traditional and social media awareness of the financial needs, the Jamaica Bobsleigh Foundation issued a release indicating that its fundraising goal had been met by private donations.